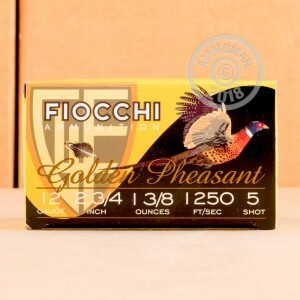 These 12 gauge Fiocchi Golden Pheasant shells are perfect for your next pheasant hunt. These shells feature a 1-3/8 oz load of #5 nickel-plated lead shot, which leaves your barrel at 1250 feet per second. This #5 shot should also be quite effective against turkey as well, making this ammo a great choice to keep in stock on your shelf. This ammo has consistent patterns out of the box, but will be even more effective with the correct choke add to your shotgun. Make sure you order enough of this great ammo to last all season long. 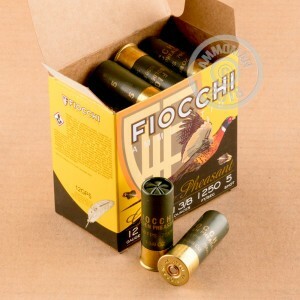 Fiocchi Ammunition was founded in 1876 by Giulio Fiocchi. Fiocchi initially created some of their own equipment to ensure quality. During the time that Fiocchi was first starting, ammunition was switching from black powder to smokeless powder, and firearms were switching to breech loaders. Today, Fiocchi produces high quality ammunition for every sector of the shooting community. You can count on Fiocchi's quality.